Pearson, T., S. Brown, A. Dushku, S. Walker. 2005. 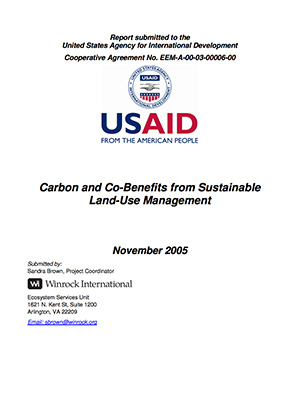 Carbon and Co-Benefits from Sustainable Land Use Management. Deliverable 13A: Impact of logging on carbon stocks of forests: Chihuahua Mexico as a case study. Developed for the US Agency for International Development: Winrock International, Arlington, VA.